The Whistler House Museum of Art, birthplace of James Abbott McNeill Whistler, was established in 1908 as the permanent home of the Lowell Art Association, Inc. Founded in 1878, the Lowell Art Association owns and operates the museum as an historic site. Built in 1823, the Whistler House presents the richness of the history and the art of Lowell. The museum maintains its permanent collection and organizes contemporary and historical fine arts exhibitions. It also sponsors varied educational and community oriented cultural programs. Works from the museum's permanent collection are on display in the galleries of the Whistler House. The focus of the collection is late nineteenth and early twentieth century American representational art, with special emphasis on the artists of New England. Among the artists represented are Frank W. Benson, Thomas B. Lawson, William Morris Hunt, William Paxton, David D. Neal, Frederick Porter Vinton, William P. Phelps, Cullen Yates, Arshile Gorky, and James McNeill. The Whistler House Museum of Art is fascinating from an historical as well as architectural vantage point. It is not only the birthplace of one of the world's most famous artists, but was the home of some of the great minds from the Industrial Revolution in America. It houses works of some of the best artists of the late nineteenth and early twentieth century, and it has one of the largest collections of works by the famous Rockport artist, Aldro T. Hibbard. Visitors may view works by many contemporary New England artists in the Museum's Parker Gallery. LOWELL, MA -- Portrait painter, cartoonist, educator, muralist, illustrator…such was the life of John Gilmore Wolcott (1891-1965). Born in Cambridge, Massachusetts, he was the son of Dr. and Mrs. Joseph Arthur Wolcott. “John G. Wolcott Revisited,” is an historic exhibit of an extraordinary artist whose interests spanned what many would consider multiple careers, and who was equally successful in each avenue he chose to explore. He distinguished himself as an ambitious soul at the age of 13 when he won a handsome touring car in a contest offered by the Boston Traveler by successfully estimating the correct number of advertisements printed in the Traveler from October 26 th to December 19 th , 1903. Wolcott was prominently featured in a photograph on the front page of the December 23, 1903 edition of the Boston Traveler sitting in his new automobile. He served three enrollments with the military beginning with the National Guard Calvary on the Mexican border. It was there that he joined the regular army for service in World War I and as a volunteer militiaman during the days of the Boston Police Strike. Wolcott received two degrees from Harvard University: a Bachelor of Arts and a Masters in Education. He graduated from Harvard University in 1914. While there he studied drawing and painting with Charles Woodbury (1864-1940), and continued his studies with Woodbury after graduation. Wolcott also studied with Denman Waldo Ross (1853-1935) and William Worcester Churchill (1858-1926). He was on the staff of the Harvard Lampoon as a cartoonist and writer. His work at Harvard included copying the past masters at the Museum of Fine Arts to learn portraiture. His copy of Major Henry Lee Higginson by John Singer Sargent (1856-1925) is owned by the New England Conservatory. In addition to landscapes, Wolcott is also known for his strongly executed portraits of several of Lowell’s most prominent residents, including Mrs. Butler Ames, Mrs. Harry Coburn, and Mrs. Charles Coburn. He also painted the portrait of the well respected Superintendant of Schools, Dr. Hugh Malloy. Wolcott contributed more than a dozen essays on education to such publications as the Journal of Education and the Educational Review . Wolcott believed that there was an important relation between education and art. It gave him a broader outlook on life and made him a better educator and teacher. From 1921 until 1951, Wolcott was the principal of the Greenhalge School in Lowell, MA. Wolcott was a member of the National Society of Mural Painters, New York City; Massachusetts State Chairman of the American Artists Professional League (1914 to 1946); and a member of the Saint Botolph’s Club in Boston. He was President of the Whistler House Museum of Art, then known as the Lowell Art Association (LAA) from 1944 to 1951. While serving as president, he led the board of trustees in decision making and planning for the organization. He began his term during the end of WW II, which was a difficult time to raise funds to maintain the historic house. Wolcott was also involved in the planning stages of building the Parker Gallery which is named after Theodore Edson Parker who bequeathed a large art collection and a sum of money to construct a new fireproof building in which to store it. Archives of the LAA also contain a letter Wolcott wrote to Winston Churchill in 1945 in hopes to exhibit his paintings. The Whistler House Museum of Art / Lowell Art Association contains in its permanent collection two of Wolcott’s oil paintings: Grant Hood House, North Tewksbury and Lowell In Gold Mist, the Vision, 1920 . Wolcott exhibited his work at the 1939 World’s Fair in New York and was in many regional shows, including the Vose Galleries, Boston, MA; the Rockport and Gloucester Art Associations in MA; and the Addison Gallery at Philips Academy, Andover, MA. In addition to murals in the Park Square Building of Boston (which have since been destroyed), Wolcott’s impressive work adorns the former Gardner High School in Gardner, MA known today as the Elm Street School. This mural has been in place for over 70 years. In his later years, he painted people riding their beloved horses, many of which were members of the Myopia Hunt Club in South Hamilton, MA, which he frequented . Peter Kostoulakos, Fine Art Conservator, was hired to clean and restore several paintings in this exhibit. “Dad became the Head Master of the Greenhalge Elementary School in Lowell, forever keeping up with his paintings on weekends and vacations. The easel was always up and ready in our living room,” said Patricia Wolcott Berger, daughter of John G. Wolcott. Catalogues will be available for purchase during the exhibit at the WHMA. John G. Wolcott Revisited is funded by the Theodore Edson Parker Foundation . Images are available upon request. 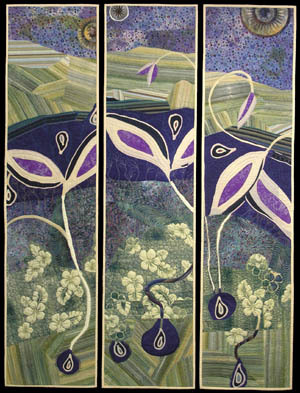 The “Art Quilts at the Whistler 2011” artist list is: Pamela Allen , Canada; Betty Busby , NM; Dianna Callahan , MO; Lenore Crawford , MI; Beverly Fine , Lancaster, MA; Janice Jones , Methuen, MA; Vita Marie Lovett , TN; Valerie Maser-Flanagan , Carlisle, MA; Nancy Morgan , ME; Margaret Phillip s, CT; Elaine Queh l, Canada; Maria Shell , AK; Barbara J Stroup , Springfield, MA; Bobbie Sullivan , Scituate, MA; and Diane M. Wright , CT.
We urge you to become members of the Whistler House Museum of Art. Benefits include unlimited free admission to the museum and all changing exhibits, invitations to all museum events and programs, a subscription to the museum electronic newsletter, and a membership card. Consider a membership to the Whistler House Museum of Art if you don't already have one. An application for membership can be mailed to your home if you reply to this email with your address. Follow the link to the website to purchase one online using Google checkout. From Route 3 North or South, or from I-495, take the Lowell Connector to the Thorndike St. Exit (5b) Proceed past the American Textile History Museum. Turn left onto Market Street, then take the first left onto Worthen Street. The museum is the second building on the right. Would you like to e-mail any request to the museum? Do you wish to receive some information on how to get your museum on the Artcom Museums Tour? This page and all contents are © 1995-2014 by Art Emotion Corp., IL. USA.